So…you’re visiting Florence? Great choice! Can’t stay a while? We can help! Tuscany’s official capital and Italy’s unofficial Renaissance capital has so much to offer the intrepid traveller that it almost feels like an insult to cram all of its sights (and delicious eats) into three days, but if that’s all you got, don’t stress. We’ve thrown together the ultimate 36 hour guide to the city. Of course, make sure to check out our walking food tours in Florence since they combine art, history, neighborhood exploration and discovering local specialties. You have a big day ahead of you, so stock up on coffee and pastries at one of my favourite cafès in the city, S.forno (Via Santa Monaca). There are plenty of bakeries in Florence, but S.forno stands out for its locally grown, stone-milled grains and wild fermentation, which produces a slow-risen organic bread. Go sweet with a panino filled with freshly churned butter and old-style jams or savoury with a salty flatbread filled with hand-cut Tuscan prosciutto. After breakfast, stroll down Via Sant’Agostino to Palazzo Pitti, Renaissance palace turned mega museum (tickets €16). There is a lot to see here. Four museums to be exact. The Treasury of the Grand Dukes on the ground floor, the Palatine Gallery and the Royal and Imperial Apartments on the first floor, and the Modern Art Gallery and the Museum of Costume and Fashion on the second floor. But if you’re strictly in it for the highlights, don’t miss the exquisite Portraits of Agnolo and Maddalena Doni by Raphael. Stop for a quick lunch at Il Magazzino in Piazza della Passera- one of Florence’s pride and joys are “lampredotto”, an offal eat of the cow’s 4th stomach! At Il Magazzino, this osteria does gourmet plays with the stuff from lampre-filled ravioli doused in sweet onion sauce and even tempura-fried lampre-sushi! They also have revered Tuscan classics for non-offal enthusiasts like Pici in a tangy tomato and garlic sauce, vegetarian “carbonara” and fried steak. From here it’s a short walk to the Pitti Palace and the Boboli Gardens (tickets €10), where you can while away the afternoon admiring the incredible collection of statues, Roman antiquities and endless gardens of roses, all designed for Florence’s most famous family, the Medici. 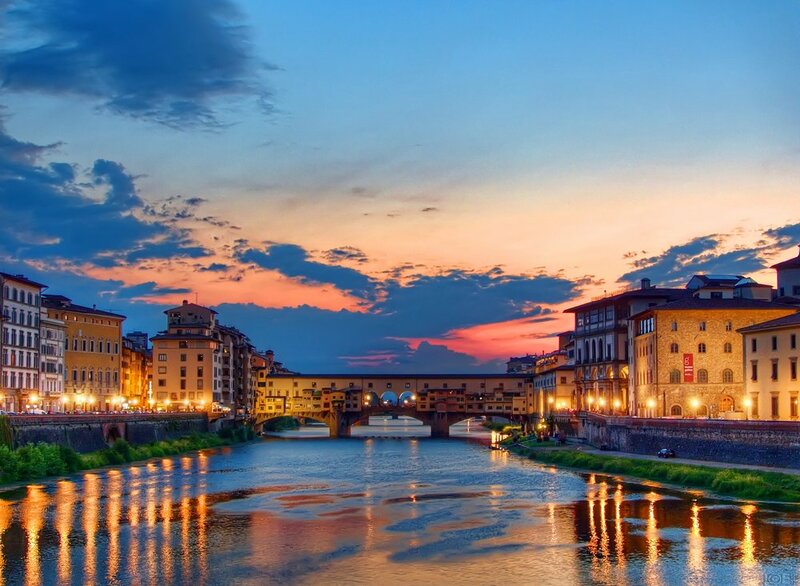 Head down Via Romana and cross the Ponte Vecchio at sunset. You’ll have to fight the crowds, but it’ll be worth it to snap the pink and yellow tinted Arno River and medieval bridge. After that, you can unwind with an apertivo before dinner or head straight to one of the many amazing restaurants in the area. My top pick? Ristorante del Fagioli (Corso dei Tintori). Run by the same family since 1966, it’s the place to go for Tuscan cuisine like Bistecca alla Fiorentina (Florence’s illustrious t-bone/porterhouse steak) and blue-collar classics like penne strascicate, pasta cooked in a very meaty sugo. Alternatively, consider our Progressive Dining Tour in Florence since we visit 4 eateries in one evening, bistecca alla fiorentina included! Start early with a stroll through the Sant’Ambrogio Market. You’ll be spoilt for choice when it comes to breakfast with plenty of stalls selling fresh fruit, artisan pastries and perfectly brewed cappuccinos, but the market is more than just a place to eat, it’s also a chance to people watch and soak up the atmosphere of the city alongside the locals (For a real insider’s take, join our Cultural Market Walk as we make a beeline for the city’s best market stalls, cheese shops and artisan gelato). From here, it’s a leisurely 15-minute walk window shopping and selfie snapping to join the masses in Palazzo Vecchio. This fortress palace was built in the 14th century, give or take a year, and is now home to the mayor and municipal council. Art buffs will want to explore the museum, but everyone else should just fork out the €10 to climb the 418 steps up Torre d’Arnolfo for the most striking view of the city. If you’re starting to feel a little peckish, grab a panino from SandwiChic on Via San Gallo 3 near the Accademia. Despite it’s very central position, the shop is brimming with a wide selection of typical Tuscany delights to build a tasty panino with, including excellent schiacciate (salty Tuscan flatbread) and artisan-sourced ingredients. After lunch, dive into Florence’s most iconic landmark, the Duomo. It’s staggering pink, white and green marble facade is incredible on the outside, while its cavernous interior is marked by frescoes by Vasari and Zuccari and up to 44 stained-glass windows. If you’re keen to visit the Cupola del Brunelleschi next door (tickets €18), bear in mind that you can only do so with advance reservations online or at the Piazza di San Giovanni ticket office. Four million bricks went into the construction of the cupola, which was designed by Filippo Brunelleschi and inspired by Rome’s Pantheon. The fare directly around the Duomo is predictably average, so for dinner, consider hightailing it to Via delle Oche for a glass of wine and platter of charcuterie at Entoeca Alessi, or head straight to Coquinarius, also on Via delle Oche, for a gourmet salad or a hearty plate of wild boar slow cooked in wine or burrata-filled ravioli with onion compote and pistachio pesto. The wine list here is extensive and fascinating, so order a bottle of vino while you’re at it. 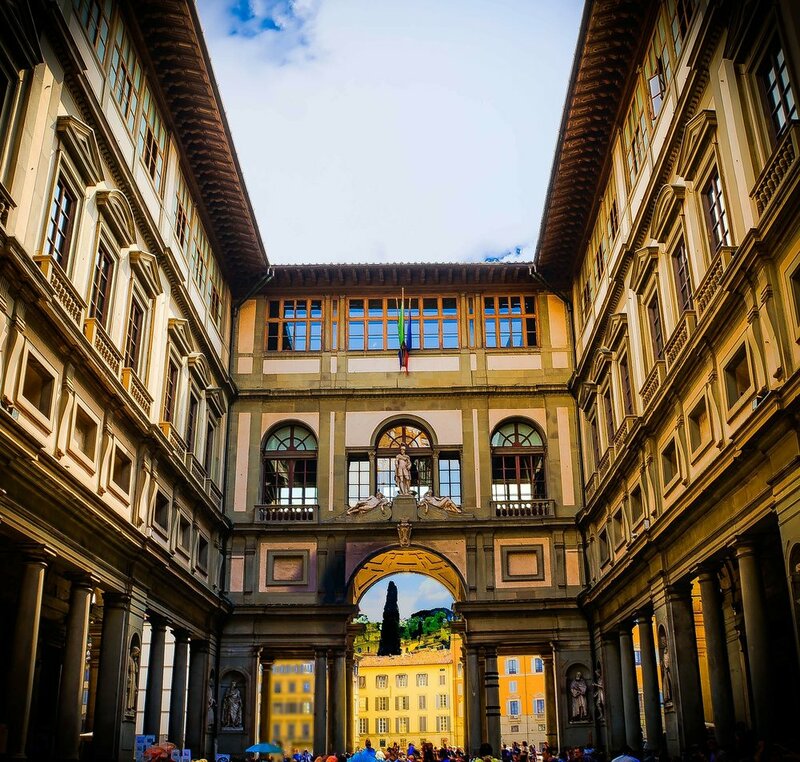 Your final morning in Florence is dedicated to the Uffizi Gallery (tickets €20). Hopefully you bought your ticket in advance, so you can skip the crowds. Otherwise get there before 8am if you don’t want to lose your whole day in line. Home to the world's greatest collection of Italian Renaissance art, it’s intense, so keep your visit under four hours and seek refuge in the rooftop café. It’s not-the-best cappuccino in the city, but it’s one you’ll definitely appreciate after all that art. The highlight for us? Giotto’s Madonna Enthroned with Child and Angels in all its golden glory. If you can hold off, make the 15 minute walk to the San Lorenzo area and enjoy traditional homestyle food at the 150-year-plus Trattoria Sergio Gozzi or at Da Nerbone inside Mercato Centrale. Gozzi serves one of the best pappa al pomodoro (bread and tomato) soups in town. While you may find the best brisket panino in town at Da Nerbone (if you’re willing to brave the lines). For a lesser sung Trattoria without all the lines/hype, I’d suggest Trattoria Enzo e Piero off of Via Faenza, here homestyle classics like Tuscan soups, pastas and meat mains are reliable and made with top notch ingredients. The local’s number one darling, Trattoria Mario (Via Rosina), is also nearby if you feel like some family-style Tuscan fare like ribollita (kitchen sink veg, bean and bread) soup or potato-filled tortelli. Everyone knows Mario and Gozzi, so be prepared for lines and food-paparazzi travelers. After lunch, explore the lesser-known, but still spectacular Basilica di Santa Maria Novella (tickets €7.50). The basilica is a treasure trove of artistic masterpieces with frescoes by Domenico Ghirlandaio, but the entire monastical complex and gardens are a breath of fresh air in the chaotic city. Spend your last hours in Florence people watching or shopping on iconic ‘vie’ like Via del Corso or Via dei Calzaiuoli before unwinding somewhere unusual for dinner like the Club Culinario Toscano da Osvaldo (Piazza dei Peruzzi) where the specialties come from all over Italy. Otherwise if you’ve tired of local fare, try one of Florence’s incredible international eateries like Ristorante Persiano Tehran, a Persian culinary delight on Via dei Cerchi. Looking for more food in Florence advice? Be sure to check out our food blog and check out our food tours in Florence for when you need a break from the crowded museums! Our tours are small and expert-led, come eat with us!